Native plants have become fashionable for use in gardens in Australia, but there are good reasons why native species are often preferable to introduced species. By choosing local plant species, you ensure that the trees and shrubs you invest in are likely to thrive. Native species from other parts of Australia will not necessarily grow well in Kuranda. For example, the Grevillea robusta (southern Silky Oak) can be grown here, but commonly the tree dies when still quite young. To avoid disappointment, it makes sense to use a local species that will thrive here. Local species have adapted to the climate, the soils, and the competition found here. Plants in the wet tropics must compete for sunlight and nutrients, and must survive not only cyclones, but the chemical warfare of other plants. Many rainforest plants use chemicals released from their roots to inhibit the growth of other plants. Local species are adapted to these conditions. If you live in the wetter area around Kuranda, then rainforest trees species are the best adapted to grow on your block. 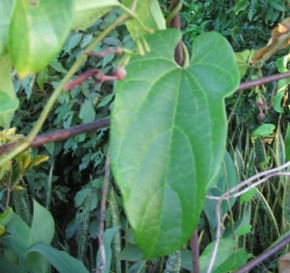 We have included two a list of local plant species, mainly trees, that grow well in Kuranda [link to target species list]. The first list is alphabetically arranged by common name, the second by scientific name. Given no interference by man, rainforest will eventually reclaim all the areas from which it has been cleared. See the vegetation map if you are unsure if you are in an area where rainforest species will thrive. Another reason for using locally sourced plants is that plants that come from the local area are related genetically to the plants already growing here. This means that the integrity of the local species is retained. By taking plants, even of the same species, that have originated outside the area, you are introducing genetic variations that may harm the local species. Given our proximity to the Wet Tropics World Heritage Area, we can help conserve the biodiversity of that area by careful selection of what we plant nearby. Check if the nursery you choose derives its seed locally, as many do not. Kuranda Envirocare always seeks to use local seed in its nursery, and most of the plants listed can be obtained there. Finding trees that can be grown safely under power lines is a problem in the wet tropics. Because of the competition for light in rainforest, most plants have developed the ability to grow upwards very rapidly, since there may be only a brief opportunity to get established when another tree falls. The plants listed show the average height in metres that they can be expected to reach, and this allows you to plan your plantings under power lines. Many local plant species provide flowers or fruit that attract birds, butterflies, and other wildlife. Careful selection will benefit the wildlife in your area. Some fruits, such as the Burdekin Plum, make great food for people, too. 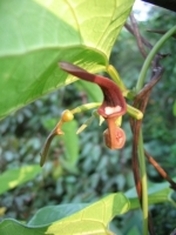 If you are planting the vine Native Dutchman’s Pipe (Aristolochia tagala) that is the host plant for the Cairns Bird-wing butterfly, please be careful that you are not sold the imported Dutchman’s Pipe, which is a close relative but actually poisonous to the butterfly. The Cairns Birdwing Butterfly is a protected species and increasingly threatened. The native species is available at the Kuranda Envirocare nursery.